We set our team out to find the best bowling ball. What worked well was that we had a wide range of bowlers—some new and some long-time tournament players. That was good news to us because it meant that we had a good example of the market. We were able to gather information on preferences and effectiveness of different bowling balls as told to us by people with varying experience levels with bowling. We took multiple bowling balls to a few different lanes to make sure our assessments were right. Each one was tested for its construction, ease of control, look, basic specs and performance. We definitely had a few stand-outs right away. We also had quite a few eliminated from the evaluation after a few throws. In the end though, we are confident that we got it right. We put together a list of the bowling balls that had everything a newbie or a pro would want. Not only does the right bowling ball help you increase your score, but it also feels good in the hand. 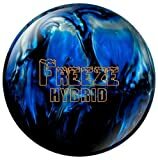 We ended up going with the visually intimidating and powerful Hammer Black Widow Legend, the artistic Storm the Lock, the icy Columbia 300 Freeze and the rich Ebonite Maxim Captain Midnight. As our top three picks and our one budget purchase, these all will serve any bowler well and they see after the coveted perfect score. 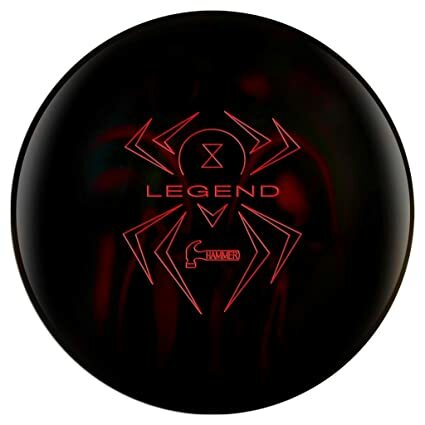 Our number one gold pick for bowling balls is the Hammer Black Widow Legend. Not only does it look great, but we found it to be reliable, durable and precise on the lanes. After hours of testing, it performed outstandingly well throw after throw. Here is our detailed report on our gold pick. Admittedly, we took notice of this bowling all because of the name. Black Widow by Hammer has long been a premier brand in the world of bowling. Hammer offers high-performance professional-quality products that are preferred by bowlers everywhere. That’s why we were excited about the Black Widow Legend and getting the chance to work with it. Some of our testers were familiar with its predecessor the Black Widow. They did their research with this new generation to see if it was truly an improvement. Thankfully, it was and then some. The Hammer Black Widow Legend is available in weights from 12-to-16 pounds. That makes it a flexible option that can be used by a wide variety of bowlers. Again, we always look for the products that will serve a wide variety of users exceptionally well. We aren’t looking for items that only benefit a small percentage of our readers. To be truly valuable, we look at the whole demographic and try to find items that play well to everyone straight across the board. Because of its diverse weight selections, we can see anyone enjoying this bowling ball from the weight perspective. On top of its good weight distribution, it also has a great design to it. The Black Widow Legend is made with a gas mask core which includes flex-resin additive, a Ceramix surface for smoothness and a carbon-fiber outer lay. What that all means is that it will give you the smooth, direct, and powerful speed you need to carry it through to the pins at the end of the lane. This ball works best on mid- to strong-lane and has a huge backend. When testing it, our users could feel the weight of the ball and how well it soared down the lane consistently. Its RG, or radius of gyration for a 16-pound ball, is 2.5 so a lot of weight is at the center, which helps early roll through the front of the lane. The look of the Black Widow Legend is great too. It is polished black with a red outline of the black widow etched into its shiny smooth outer core. This is a great design that anyone would be proud to bring to the alley. It also has a bit of intimidation to it. Just think of how you can play a mental game with your opponents by bringing the Black Widow Legend to the lanes. We definitely got a good number of side glances when we visited the bowling alley armed with this ball. We enjoyed the intimidation factor, and likely so will anyone who tests it out themselves. The Black Widow Legend also comes with a 3-year warranty. We love manufacturers who are willing to stand up for their products and offer their customer’s long-term support. In the end, this is the one that won out among the many we tested. Its weight, look and efficiency on the lanes are what won us over. For your next tournament, consider using this one. Likely it will help you get the bowling scores you have been working towards that much easier. Our second place bowling ball went to the Storm The Lock. This one made it on our list because of its precision drive and construction. We found that the Storm The Lock was easily able to get our pin action up significantly higher than with any other product. This likely is going to be a great advantage to any bowler testing it out. Here is the complete review of the silver choice on our list. We loved the look of the Storm The Lock too. Like our Black Widow Legend, it has a great intimidation factor to it. This one comes with black, white and crimson splashes of color on it. We loved how each ball in this series has its own distinct and unique look to it. Just like the number one pick, we got more than a few looks at the bowling alley with these. We’d like to think those looks were part of our collective bowling excellence, but let’s face it, it probably was the Storm The Lock. The Storm the Lock is engineered with a shape that promotes even roll. It has an asymmetrical RAD-X core that is super-dense and can create a fantastic hook. If you have problems with your hook shot at all during bowling, consider testing this one out. It managed to compensate for any issues our testers had with this problem. It also allowed them to increase their scores once they got used to the new ball. The weight block of the Storm The Lock is also regulated perfectly by the manufacturer. By working to perfect it, they assure that the ball will have a great rev rate as it plows down the alley lane. On top of that though, it will also have a great speed to it. Storm The Lock is available from 12-to-16-pounds. Again, this makes it highly customizable. Whether a bowler is used to working with a lighter ball or a heavier one, this can easily be ordered. A 16-pound ball boasts a 2.47 RG, or radius of gyration. Just like our number one pick it is low on this scale, meaning its weight is in the core. The factory finish is 3000-grit Abralon and its durometer is 73-75 Rex D-scale. Specs like this make for something that will easily soar down the lane for you. The look is fantastic too. The Storm the Lock looks just like that—a storm. It combines deep crimson with white and black to showcase a flurry of color rushing down the bowling lane. You’ll love how it looks when you send it down. We can’t think of how the company could have made a better looking ball and newbies along with pros will love using it. If you are looking for a fantastic bowling ball that can perform throw after throw, consider the Storm the Lock. It is great with hook shots, it’s fast and it’s sleek. Test it out for your next bowling tournament and you’ll likely love crushing the competition one pin at a time. Our bronze pick for best bowling ball goes to the Columbia 300 Freeze Hybrid. We liked it mostly because of the control it gave to our bowlers and because of its core-heavy construction. Here are our official thoughts on why it’s a great product. What we liked most about this bowling ball was its core construction. It was obvious right away that the Columbia 300 Freeze Hybrid is modified with a hefty core weight. The core weight of course affects the mass distribution of the ball—if it’s denser at the center versus denser closer to the core. With a center-mass and RG of 2.56, the 300 Freeze is similar to our gold pick in terms of how it moves down the lane. We noted that it was very sleek and traveled quickly. Part of this can be attributed to its New Era Hybrid veneer. The coating of the Columbia 300 will help it to travel down a lane efficiently. It is suggested to use this particular model on a medium- to dry-oiled lane. We can see how this is appropriate because of how well the ball gripped as it moved. We were impressed by the coverstock of the 300 Freeze. It was note by manufacturers as 800, 2000, 2000 Abralon with an additional factory polish. This made for a coverstock that not only shoots down the lane efficiently, but grips the lane surface as it moves. The benefit is of course more precise drive, based on your own personal hooking. Speaking of hook, this ball also has a great flare to it. It easily was able to help a few of our testers move 2-3 boards wider in flare than its predecessor the Freeze. We also loved the amount of control Columbia 300 gave us. We had our tournament bowlers and our novice bowlers do their own modifications of stance and hold to see how easy it was to move the ball down the lane. The 300 Freeze pummeled the pins with a direct curve that was effortlessly user-modified. 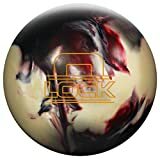 If you know the result you want, this ball can get it for you with the right bowling technique. The look of the 300 Freeze is also pretty cool. Its durable coating hugs the lane tightly with black and blue swirls of color spinning down the lane. Not only is it comfortable to use, but it looks pretty cool as it rushes the pins. The Columbia 300 Freeze Hybrid isn’t as intimidating as our other choices, but that doesn’t mean it won’t get you looks of envy at the alley. The looks will be cause of how sleek and well-designed it is and it still has the ability to make you look like the professional to watch. In the end, this was a great product. We loved the 300 Freeze because of how well constructed it was. Not only was it enjoyed by our long-time bowlers, but our newbies loved it too. If you are looking for a ball that has a lot to offer and gives you great control too, check this one out. It could be the next success story for you at the lanes. As is our way, we always pick one product that isn’t ready for top-three standing, but still deserves a nod. With bowling balls, this honor goes to the Ebonite Maxim Captain Midnight. During testing, it held up well and as a budget buy, it’s great. Here are our official reviews on this ball. 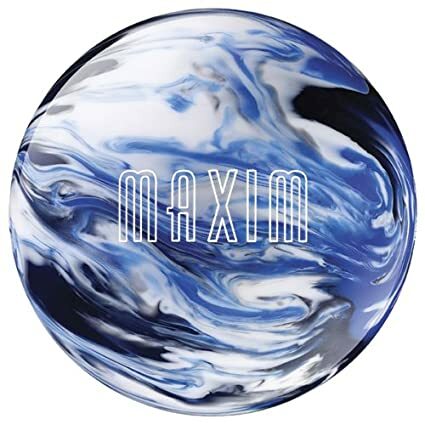 The Ebonite Maxim Captain midnight bowling ball is meant for any oil-type lanes. This is due to its RG. We noted this right away as we watched its flare potential. One by one we had our testers use it to see how it would perform. It consistently was able to give a small amount of migration as it moved down the various lanes we tested it on. It also works well with one of the lower hook potentials we saw. For bowlers looking to have a modified hook to their throw, this is a great option. We also saw Maxim Captain as a good starter-option. It isn’t as flashy or as intensely constructed as our other products, but as a ball for a new bowler it serves its purpose well. The official hook potential of this ball is a 1, which makes it minimal where the scale is 1-to-30, with 30 being the most hook. The sizing for this Ebonite is different than our other contenders. This one is available in 8-to-16-pounds. This plays well for a wide range of bowlers and it’s one of the main reasons why when looking for our budget pick, we revisited this one. We believe that it can potentially be the perfect starter bowling ball for a wide variety of bowlers—young and old. It also has a great feature to it in that it glows in the dark. For kids that’s a highly desirable feature. Imagine being at the bowling alley and wowing friends with a glow in the dark ball. When we tested it out, we also got quite a few stares as it shot down the lane. Not only is it functional, but the Ebonite Maxim also looks great. It is made from polyester. That might sound odd that a ball is constructed with polyester, but after testing we realized that it was still efficient and easy to direct. With coverstock that is super durable, it gives bowlers a ball with low friction. It easily is able to soar down the lanes. A lot of pros like polyester balls for this reason. Nothing else is able to fly as targeted as polyester. On top of being efficient, having a polyester ball like this one is going to last for years. It is highly durable and you won’t likely have to worry about any degradation of body. It also has a great look to it. The coverstock is bright and fun with its glow in the dark feature. Like our others, this one is a high-gloss polished shell. The core is bullet. Because it can effectively take to oily as well as dry lanes, we can see it becoming a good overall reliable product for new and old bowlers in the family and on the leagues. Plus at its base price, it is a great buy. If you are looking for a versatile and reliable ball that performs well on any lane surface, consider the Ebonite Maxim. Not only will you love its handling, but you’ll have more fun with its glow in the dark feature. When it came to our pre-purchase considerations for finding the best bowling balls, we decided to get detailed. Sure we wanted the good feel and look, which is normal with all of our assessments, but we also wanted to know the numbers. Metrics were key. We wanted to know the rate of gyration, the flare potential, the type of lanes (oily or dry) each played best to and the coverstock. We put that together to be sure that we were truly finding the best products out there. We also considered our audience. Our readers are diverse, so we wanted products that could benefit new players, as well as professional players. Thankfully our team of testers fit well into that profile and we were able to get opinions from the qualified bowler and the not-so qualified bowler. We put it all together to find out which bowling balls were the best and which ones were mediocre. The following is a list of what we looked at specifically as we broke down our criteria for testing. The first thing we looked at with our test bowling balls was how they feel. We have more than a few tournament bowlers in our group so we were able to put our products to the test. One by one, we tested our contenders for their overall comfort during line-up and throw. We wanted to be sure that both were on pointe. With the line-up, we wanted to be sure the bowling balls were balanced properly to allow for tight holds that easily centered to our bowlers as they approached the line. We thanked manufacturers for their evenness in construction, with tight core elements. We also tested the throw and how well each product aided in clean delivery. Again- this was a sign of how well the ball was constructed. It had to have a solid weighty core, with a sleek and smooth finish. Luckily, all of our ending picks had just that. They allowed our avid bowlers and our new bowlers to follow through effectively with their throws time after time. This is exactly what we wanted. A ball that was balanced and comfortable to anyone using it. Sans weight preference, we believe the four bowling balls on our list can easily be used effectively by any bowler with minimum problems. Next we looked at all of the mathematics of a good bowling ball. This also has a lot to do with the construction. Here’s where we looked at what oil each ball played best to. We also looked at their radius of gyration. A low one meant that the ball’s weight was closer to the center; a higher one meant the weight was distributed to the shell. Whichever one we had, we wanted to make sure it performed well. Our bowlers took both distributions into account and made sure that they were easy to use. We also looked at the general differential of each ball. The differential indicates the amount of flare potential of the ball. We wanted to be sure that the flare potential was right and what lane conditions it was right for. For example, a product with high flare plays better on an oily lane. A ball with a low flare plays better on a drier lane. We tested each of our bowling balls to make sure manufacturers were right about the flare potential and made recommendations based on that. Finally, coverstock was a concern. It determines how well the ball will grip the lane’s surface. We did our due diligence with studying and noting this on all of our selections. We also looked at the design of the core because that determines how the ball will roll. Little things like this all played their part in our review and we wanted to be sure to note what would aid in throwing for good bowling score versus a great one. This was the fun part of our jobs. We got to debate the looks of bowling balls. There are a lot of manufacturers and each one managed to come up with one design more exciting than the last. We loved sorting through the bowling balls. Gone are the days of a plain black ball indistinguishable from the rest. Those were during the boring days of bowling. Thankfully, now that bowling has taken its rightful place in the sports world, it has caused manufacturers to be more creative than ever. You will find balls that have dazzling colors rushing down the lanes. We loved the black widow spider etched in red on our gold pick. We also loved the crimson splash of color on our silver pick. Our bronze pick wouldn’t be outdone with its blue and black swirls, reminiscent of a storm. Finally, our budget pick played perfectly with the design factor as it was covered with blue, white and black swirls to it. On top of liking the look, we also recognized that some designs had the ability to intimidate more than others. If you like that sort of thing, we made sure to note it in our reviews. What better way to arm yourself for a tournament than with a bowling ball that looks like what the pros use? In the end we found the bowling balls that serve best for a wide variety of bowlers. Any one of our selections will make you proud as you venture to the local bowling alley. Whether you are in a high-priced tournament or just taking the kids to bowl on a Friday night, you’ll love our choices.